The European Parliament voted by 619 votes to 33 (with four abstentions) on 11 December to approve a new European Union (EU) Directive on ambient air quality and cleaner air for Europe (the Directive) that is expected to merge four current EU Directives on air quality and a related Council Decision into a single text. The new Directive is still subject to formal approval by Europe’s Environment Ministers who are due to meet on 20 December. It is expected to be implemented by the EU in mid-2008. UK Government Ministers need to stop their obsessions with obscuration and using cost-benefit analysis as their only tool for decision making. At the same time as the European Parliament was approving new air quality legislation for Europe, the Secretary of State for Transport published her Department’s Autumn Performance Report for 2007 to Parliament that admitted that only four of seven objectives are currently being met for air quality (for which the Department for Transport (DfT) and the Department for Environment, Food and Rural Affairs (Defra) are jointly responsible). DfT plans to replace 2010 objectives for PM10 by a new PM2.5 exposure reduction objective which will be reported upon next year [CCAL: DfT is planning to move rickety goal posts]. Jean Lambert MEP, Green Party, said: “Air pollution kills far more people than road traffic accidents in London. Poor air quality, from coarse particulate matter alone (PM10), is the cause of around 1,000 premature deaths and a similar number of hospital admissions every year. Baroness Ludford MEP, Liberal Democrat, said: “The EU has succeeded in both simplifying and strengthening air pollution laws in order to get tough on improving air quality across Europe. If governments act early, then they can meet the targets. We must have no repeat of experience in London where deadlines for cutting diesel pollution were missed. “The UK government must not duck and weave on these pollution-cutting goals. It should tackle head on hotspots at key sites such as central London and must not try to wriggle out of pollution limits around Heathrow in order to sneak through a third runway. “The environmental impact of a third runway would be intolerable, and the noise and air pollution impact on the health of local residents unacceptable. The European Commission will have to be vigilant that the new air quality rules are fully respected not sidelined. What is in the new EU Directive? The success or failure of the new regime may depend ultimately on the determination of the European Commission to enforce the new Directive. In this context, it is reassuring to read that the Commission is already preparing for the task by ensuring that adequate resources are available for dealing with any requests for time extensions in respect of specific locations where PM10 Limit Values are in breach and is organising technical support in order to be able to objectively analyse whether the conditions are fulfilled. Given also the close links between the climate change and air quality aspects of air pollution, it seems highly likely that the Commission will enforce the new Directive fiercely. The new references to the importance of children’s health as a special concern in air quality plans and programmes are most welcome and will enable CCAL to press for action to be taken to protect these groups. Air pollution in the EU, notably from fine particulate matter and ground-level ozone, presently causes the premature death of almost 370,000 citizens every year and reduces average life expectancy – across the whole population – by an average of nine months. In the most polluted areas, the loss of life expectancy may be up to two years and perhaps more. There are worrying signs that biomass burning and local power generation could structurally undermine efforts to improve air quality. After years of failure in the UK’s air pollution policy, insufficiently ambitious targets and a lack of strict enforcement by the EU, it is essential that UK Government Ministers grip now a problem that they have let get completely out of control. “The Campaign for Clean Air in London (CCAL) gives conditional support to the new EU Directive on air quality that has just been approved by the European Parliament. “CCAL thanks all those who have been involved in thrashing out a compromise, between seemingly strong conflicting demands, that has been reached finally between the European Parliament, the European Commission and the Council of Ministers. Key contributors have included President Barroso, Commissioner Dimas, the EU Environment Directorate General’s Air Quality team over more than two years and the civil servants in Defra’s Air & Environment Quality team. Unexpectedly, the final outcome achieves one or two key objectives for each of those stakeholders, instead of a weaker Directive that has been feared for two years, which would not have met, for any of them, any of their key objectives. CCAL understands that there has been no intransigence by any one group of stakeholders in the final negotiations that could have resulted easily in a weaker outcome for Europe’s citizens. “London MEPs particularly have worked hard in defense of existing environmental protections. The Campaign for Clean Air in London highlights particularly the special contributions of John Bowis, Jean Lambert, Baroness Ludford and Claude Moraes whose tireless work will surely save countless London lives. Without their personal contributions, deadlines would have been delayed further and the Council of Ministers would not have accepted a tightening of controls on fine particulate matter. It is very worrying that so much effort has been needed to defend existing environmental protections when the world needs to be strengthening them rapidly. “In reaching the above package, the European Parliament has achieved a lower objective forPM2.5 of 20 μg/m3, which is the air pollutant deemed most important for health, compared to the 25 μg/m3 wanted by the Council of Ministers. At the same time, the Council of Ministers has achieved a shorter backstop date for the implementation of the current Limit Values for PM10 and NO2 compared to the longer delays that some MEPs (outside London) had been seeking. This has been done without: introducing new burdens of proof before Member States can take action to improve air quality; two stage time extensions; or a weakening of the effectiveness of the Limit Values everywhere that had been feared. The Campaign for Clean Air in London has only one aim which is to achieve urgently at least World Health Organisation recommended standards of air quality sustainably throughout London. Given that most of these standards have been required to be met since 1999 legislation by January 2005 (for particulate matter i.e. 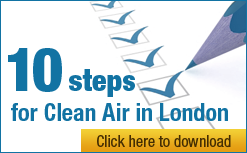 PM10) and January 2010 (for nitrogen dioxide NO2), CCAL has been campaigning to achieve these standards by the London 2012 Summer Olympics as part of the “greenest Games” in modern times. CCAL has received support from Mayor Livingstone, Sian Berry (the Mayoral candidate for the Green Party), leading politicians of all political parties in London, all the amenity societies representing Central London and leading business including the Central London Partnership, London First and The Knightsbridge Business Group. It is a cross-party campaign. In 2001 the European Commission launched the Clean Air for Europe (CAFÉ) programme. Following the CAFÉ analysis, the Commission adopted in September 2005 its Thematic Strategy on Air Pollution. By establishing objectives for 2020 in the strategy, the Commission set the level of ambition regarding air quality in the EU up to year 2020. The Thematic Strategy was accompanied by a proposal to merge the Air Quality Framework Directive and three daughter directives containing minimum requirements for air quality.